Atomic changed the name, but not the singular purpose. The Backland UL 78 is a ski mountaineering weapon. The ski is capable of slicing and dicing on hard snow, while remaining playful in soft snow due to the lightly rockered tip. The double-carbon construction is reliable on the steeps and the ultra-light wood core helps you get it done. The Backland UL series features the same Step-Down sidewall that proved durable in the Ultimate line of mountaineering skis. The tip has been redesigned to help it cut through rough patches, but otherwise the ski remains a workhorse. 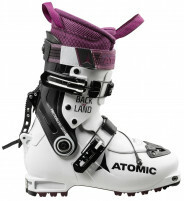 The Backland UL 78 is a safe bet when you’re skiing not-so-safe lines. 15% rocker in the AT 2.0 tip makes skiing powder and mank more of a joy than a pain. Two fiber inserts make the ski Carbon Powered which improves torsional stiffness. Multi-wood core offers the lightness of Paulownia with the strength of Poplar. Step-down sidewall is thicker underfoot where you might expect most impacts. I have used these for almost every kind of fun: trips light, long, short, quick, slow, any kind of outing over several seasons. I've also loaned them to folks who swear they are the lightest funnest skis for kicking around everything from the backyard to the resort to the skin track to real ski mountaineering objectives, especially if you keep the length short. They edge well, plow through crud well enough and can float pretty well in soft snow, as long as you are not packing weight. They are fun and bouncy edge to edge, hold on ice, and the rocker is more noticeable than other Atomic and similar size skis I've used, and in a good way. I wish I had gotten my skins with a race tip/toggle and would change that if I could motivate. I think this would be the ski I'd feel most secure on whether skinning around the woods or dropping into a tight chute. I use with tlt 5s or 6s and dynafit low tech bindings. 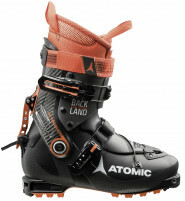 Trying to decide between the 2019 Atomic Backland 85 and the 2019 Atomic Backland 85 UL. Can't seem to find the find what difference is between the two. Any help is appreciated. I have skied these about 20 days in backcountry in various conditions in 175cm (114-78-104), with Dynafit TLT6 boots. Overall, I was very happy with the skis although I found the radius to be a little short for my liking. The skis ski well through crust and on firm or wind affected snow. I didn't ski anything super steep or icy so can't comment on that but they performed well on 40-45 degrees. They seem well built and quite durable. it is a very similar on paper (174cm and 116-78-97) but the slight differences add up for me (a bit lighter, flowing better in deeper snow). See my review on that page. Is there a weight limit on this ski? This seems like a good "race" ski for a 200lb + tall guy if run in the 169 length? Could it handle that? Hi Aaron, I'm pretty close to your weight and have been skiing this ski on that length for the last year. It's been fantastic! It's quite a burly, durable construction for such a light ski. Definitely can work as a race ski for a big guy, but it's completely serviceable as a mountaineering ski and mission oriented touring ski, even at your size. Thanks Nate! In full disclosure, I am actually 150# and 5'9" but a guy I know is your size and looking for a race/light and fast ski and I thought this might be the ticket - good to know your experience has been a good one! Just checking here, but this 'step-down' sidewall - it's exactly the same as the new Salomon S/Lab X-alp right? Hi Joseph, the Salomon X-Alp ski doesn't have a sidewall, but yes, the Atomic Backland UL does have a mini sidewall underfoot.